If you have the desire, now you can unclutter your bookshelf and enter the 21st century by recycling your yellow-outlined National Geographic magazines. In their place, get your hands on the magazine’s entire library of issues via a special NG hard drive. Dating back to 1888, the hard drive has every issue through 2008, including advertisements, photos, maps and stories. Though the pricey archival set comes on a 160-gigabyte hard drive, 100GB of it is empty, allowing you to add your own files. 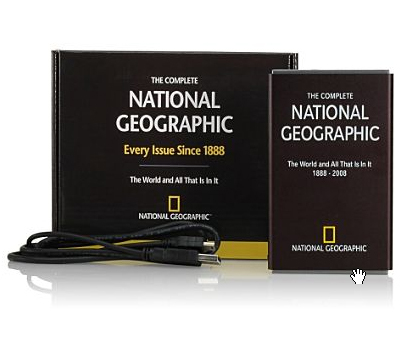 The package contains a DVD with tips from and interviews with National Geographic photographers as well as a look at how the magazine is put together.